Update (22/12/17) — The following piece was written just before Christmas 2016, when HRH’s Radio 4 “Thought for the Day” caused some controversy. However, following this tweet on the same topic (19/12/17), one of my Twitter followers kindly tweeted a link to this article, which I hope remains of some interest. "It is heartbreaking beyond words to see just how much pain and suffering is being endured by Christians, in this day and age, simply because of their faith." The Thought for the Day of HRH The Prince of Wales three days before Christmas has generated a great deal of interest in the press and on social media. His words have been seized upon, and celebrated, by the liberal left as a rebuke to Donald Trump and perhaps even UKIP. The conservative right have (bizarrely) interpreted his address in similar terms and felt wounded and resentful. Both sides, I would suggest, have missed the point. The full text of HRH’s ‘thought’ is at the end of this post, but we should begin by noting both what he actually did say and what he did not. Much of his message consisted of statements of fact (e.g. that Christians are being persecuted in the Middle East, that more than 65m people fled their homes in the past year, and so forth). Such statements are either true or they are not. Given the quasi-homiletic nature of Thought for the Day, what is more problematic is the question of what the Prince of Wales may have been implying and, even more so, what we might infer from his words. I would suggest that his words were sufficiently nuanced to mean that what we are really taking about is inference and not implication. We are now seeing the rise of many populist groups across the world that are increasingly aggressive towards those who adhere to a minority faith. 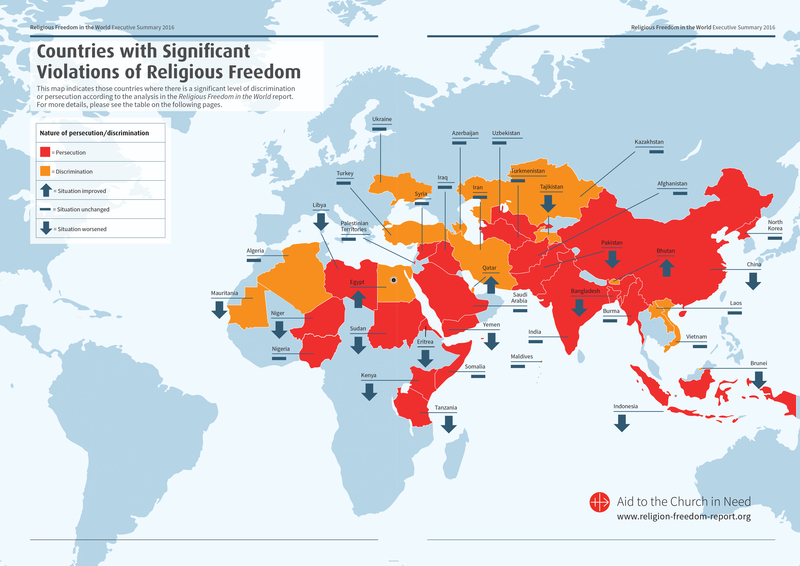 Nor is (persecution) limited to Christians in the troubled regions of the Middle East. A recent report suggests that attacks are increasing on Yazidis, Jews, Ahmadis, Baha’is and many other minority faiths. It’s pretty clear, then, which ‘minority faiths’ he has in mind. His single, brief, mention of Muhammad was fairly obviously included to rebuff any charge that he was talking only about Christians, Jews and other non-Muslims. Also, it serves as a reminder to Muslims that their own faith can only flourish when it enjoys freedom — a freedom that hard line Islamists deny to other faiths. Some of the more ludicrous articles on the internet have even tried to suggest that HRH was suggesting that we should “think of Muhammad and not Jesus” at Christmas. His mistake, surely, was the use of the word ‘populist’, even if this was the word that succeeded in garnering much press coverage. If ‘populism’ means anything, then it is a ‘thin ideology’ (cf. Cas Mudde, 2004) which pits the people against ‘the elites’ in a not very reflective manner. In the arrogant and aloof statements of EU bureaucrats it is just a synonym for democracy, of course, but beyond that it is more complex. Brexit has been called ‘populist’ and so has the election of Trump. This does not mean that whatever is populist is either Brexitarian or Trumpist. I campaigned for Brexit from a pro-free market, pro-sovereignty (and indeed pro-immigration) position. I realise that many people who voted for Brexit did so for other reasons, many of which I would disagree with. We were all, perhaps, part of a populist wave. Insofar as populism is a revolt against the ‘elites’ then this at least implies that the ‘elites’ — whoever they are — need to listen. It is interesting to note that the ‘elites’ in Britain — the Prime Minister and (most) other previous Remainers in her government, not to mention members of the pro-Remain Labour Party who believe in democracy — have listened. Yet the ‘elite’ in the EU, against whom the Brexit vote was really directed, have simply put their fingers in their ears and carried on as usual. Populism gives rise to temporary movements. Before the EU Referendum, my Leaver Twitter followers were engaged in the same struggle as I. Now that battle is won, we have returned to real, democratic politics, and our disagreements on markets, immigration and freedom are re-emerging. But let’s remember that other ‘populist’ movements are Podemos in Spain, the cheerleaders of Chavez and his heirs in Venezuela, and even Jeremy Corbyn. Jezza’s recent reinvention as a ‘populist leader’ was rather amusing. He represents an old hard-left ‘thin ideology’ which has nothing to say except a rejection of “the Tories” and so-called ‘austerity’. If, per impossible, he were elected Prime Minister in 2020, then that fragile populism would give way to real democratic disagreement about the way to proceed. So Prince Charles, I would suggest, is talking about that kind of ‘populism’. Not the democratic will of a people, but a temporary, single-issue, hastily confected confluence of feeling. Does this sound like a libtard plea to welcome ISIS fighters with open arms, or does it sound like a plea to be generous and compassionate toward their victims? ‘He told me of mass kidnappings in parts of Syria and Iraq and how he feared that Christians will be driven en-masse out of lands described in the Bible. He thought it quite possible there will be no Christians in Iraq within five years. ‘Clearly, for such people, religious freedom is a daily, stark choice between life and death. 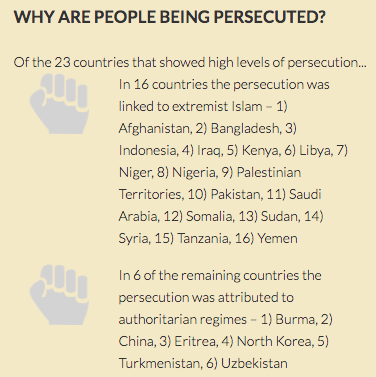 The scale of religious persecution around the world is not widely appreciated. ‘Nor is it limited to Christians in the troubled regions of the Middle East. A recent report suggests that attacks are increasing on Yazidis, Jews, Ahmadis, Baha’is and many other minority faiths. ‘And in some countries even more insidious forms of extremism have recently surfaced, which aim to eliminate all types of religious diversity. ‘We are also struggling to capture the immensity of the ripple effect of such persecution. ‘According to the United Nations, 5.8 million MORE people abandoned their homes in 2015 than the year before, bringing the annual total to a staggering 65.3 million. That is almost equivalent to the entire population of the United Kingdom. ‘And the suffering doesn’t end when they arrive seeking refuge in a foreign land. We are now seeing the rise of many populist groups across the world that are increasingly aggressive towards those who adhere to a minority faith. ‘All of this has deeply disturbing echoes of the dark days of the 1930s. I was born in 1948 – just after the end of World War II in which my parents’ generation had fought, and died, in a battle against intolerance, monstrous extremism and an inhuman attempt to exterminate the Jewish population of Europe. ‘That, nearly seventy years later, we should still be seeing such evil persecution is, to me, beyond all belief. We owe it to those who suffered and died so horribly not to repeat the horrors of the past. ‘Normally, at Christmas, we think of the birth of Our Lord Jesus Christ. I wonder, though, if this year we might remember how the story of the Nativity unfolds – with the fleeing of the Holy Family to escape violent persecution. ‘And we might also remember that when the Prophet Mohammed migrated from Mecca to Medina, he did so because he, too, was seeking the freedom for himself and his followers to worship. ‘Whichever religious path we follow, the destination is the same – to value and respect the other person, accepting their right to live out their peaceful response to the love of God. ‘That’s what I saw when attending the consecration of the Syriac Orthodox Cathedral in London recently. Here were a people persecuted for their religion in their own country, but finding refuge in another land and freedom to practise their faith according to their conscience.